A sea-view villa with a real wow factor, that sleeps 8. Villa Makaria is a spectacular place to stay when you're on Rhodes' east coast. Between Kolympia and Faliraki, you will find Afandou. A sea-view villa with a real wow factor, that sleeps 8. Villa Makaria is a spectacular place to stay when you're on Rhodes' east coast. 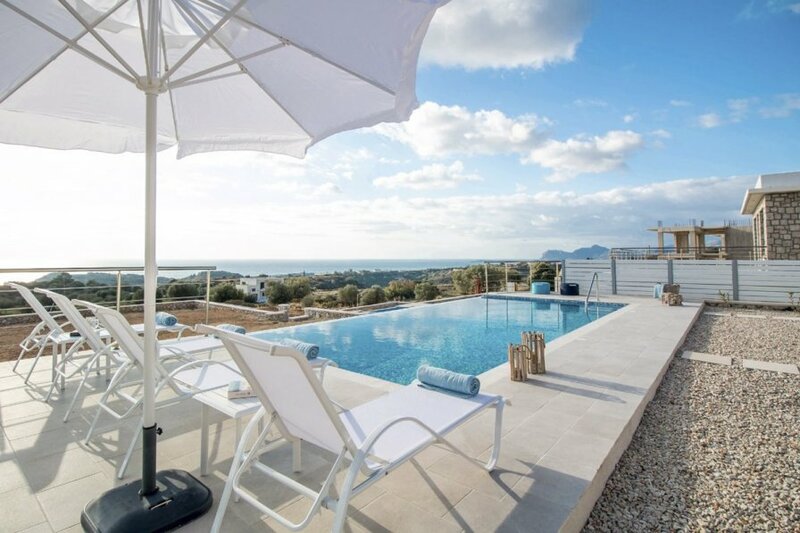 Between Kolympia and Faliraki, you will find Afandou, where Villa Makaria occupies a breath-taking location; complete with private pool, terrace and landscaped gardens. The outdoor spaces at this villa are inviting and invigorating, with the fresh sea breeze and near-constant sunshine likely to prove irresistible. There is a covered area with dining table, chairs and barbecue, as well as a comfortable seating area, while sun loungers and armchairs line up poolside. The 9m x 4m pool is a pleasure at any time and looks particularly beautiful when lit at night. Patio doors take you from the terrace to the interior living space, which offers flat screen TV with satellite channels and a surround sound music system. You have comfy sofas in this light and spacious area, as well as a dining table with a view of the ocean. This open-plan space also incorporates the kitchen, which is well-equipped for cooking and entertaining. The villa has four bedrooms, three of which feature a large double bed. The fourth has twin beds. All of the bedrooms have a smart en-suite bathroom. Air-conditioning and free Wi-Fi are among the extra advantages of Villa Makaria, where you will be met by the owners who do everything they can to make your stay perfect. Afandou is known for its Blue Flag beach and golf course and offers all sorts of restaurants and amenities. Two of the island's best-loved beaches are just along the coast – Anthony Quinn Bay to the north, and Tsambika to the south, where the rugged cliffs and extensive golden sands attract sunbathers and water-sports enthusiasts alike. The island's capital is just over 20 minutes' drive from Afandou, with the airport not much further, making this coastal spot easy to reach. Also, don't miss a trip to the peaceful Valley of the Butterflies or the Lindos Acropolis, two more must-sees when you stay at Villa Makaria. Situated between Lindos and Rhodes town and just a 5 minute drive from the blue flag awarded beach of Afantou. The Anthony Quinn bay is just 2 miles away. Hugely popular as a tourist destination, Rhodes is an island with more than its fair share of natural beauty and landmark sights. The town of Rhodes, a 10 mile drive, is as good a place to start as any and lies on the northern tip of the island. A walk along the medieval walls of the Old Town will offer you some beautiful views, accessible from the must-see Palace of the Grand Masters. Part of a World Heritage Site, this is also the location of a fine museum which offers the chance to familiarise yourself with Rhodian history, extending as far back as the 3rd century BC. Another museum worth checking out is the Museum of Modern Greek Art, with an eclectic collection only rivalled by Athens. The New Town area is visually appealing itself, with an Art Deco influence present in much of its architecture. Mandraki harbour is the home of Evangelismos Cathedral, where you can find some impressive frescoes. The Lindos Acropolis is as spectacular as the coastal views it enjoys, and worth seeing. Down the coast, you also have resorts such as Ammoudes, Kolympia and, perhaps best-known, Faliraki. While its reputation may precede it, this is not the hedonism capital it once was. A children's water-park and the beautiful Anthony Quinn Bay may tempt you there during the day, and an aquarium and scuba-diving school also embrace the aquatic theme.